There’s a new Web tool in town that makes fact-gathering a breeze for journalists. 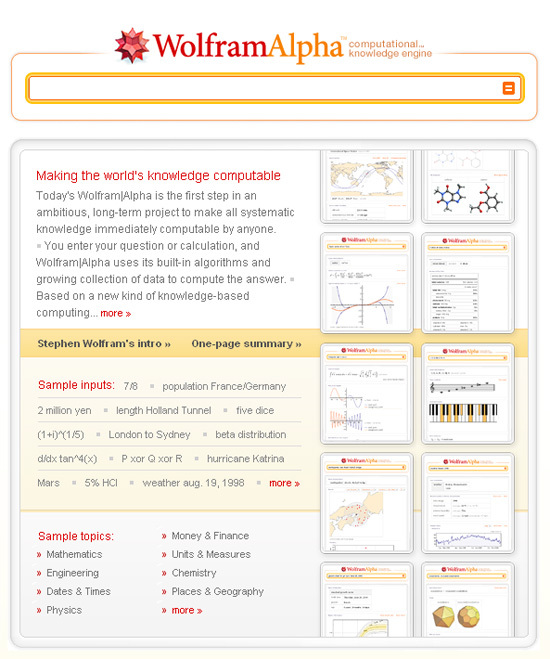 It’s important to note that WolframAlpha isn’t a search engine in the traditional sense. It doesn’t like to content directly and doesn’t search the entire Internet. Instead, it relies on a combination of proprietary and public data sources to compile information. More info and a poll after the jump. Take, for example, a search for General Motors, a subject that’s likely to come up in reporting (click here to try it). WolframAlpha returns a nice selection of basic information about the company, including financial and stock performance, location and number of employees. This is convenient since it puts commonly-requested information at your fingertips rather than having to dig through multiple pages to find what you need. Much of the information is also the kind that journalists need fast access to often, which makes this a great tool for reporters. Where possible, information is displayed in visual format, whether a simple table or more complex graph or chart, which is great for at-a-glace skimming. Results can also be downloaded as a single PDF file so information can be printed and stored for easy access. The service also supports multiple question in a single input as well as allowing users to enter natural-sounding queries. For example, entering “What is the fifty-second smallest country by GDP per capita?” yields India, $725.76 per year (click here to try the query). Not only does this type of search show the answer, but it also helpfully provides a chart showing countries above and below India’s GDP. Another advantage is that WolframAlpha provides source information via a link at the bottom of the page. Data sources tend to be more reliable than, for example, Wikipedia’s sometimes sloppy and inconsistent citations. WolframAlpha bills itself as “curated” and also allows users to contribute their own knowledge to its weak or entirely lacking areas of information (which happens fairly frequently since the tool just recently launched). A good way to learn more about the service and how it works is to visit the examples section of the site. This directory, sorted by topic, includes clickable samples of how to use WolframAlpha to your advantage.